The fermentation of kimchi is carried out through a naturally controlled brining process. During kimchi fermentation, microorganisms should be tolerant to salt, acidity, anaerobic conditions, and endogenous antimicrobial compounds in the ingredients. The main microorganisms involved in kimchi fermentation are LABs, which are facultative anaerobes, microaerobes, or anaerobes. Several factors, such as salt concentration, temperature, pH, microorganism population, and air exposure control the kimchi fermentation process. The microbiological sequence of lactic acid fermentation in kimchi is similar to that of the lactic acid fermentation of sauerkraut, but it is different owing to the other subing-redients, as shown before. The brining process extracts the water from the raw materials by osmotic activity and suppresses the growth of undesirable bacteria that could spoil the kimchi ingredients. At the same time, the brining conditions offer a relatively favorable environment for LAB under increased salinity. The number of total viable bacteria, yeasts, and molds is found to be markedly decreased by 11 to 16-fold for bacteria and 29 to 87-fold for yeasts and molds in varieties of baechu cabbages imbued with 10 percent NaCl for 10 hours. In contrast, LAB levels increased to 3- to 4-fold, indicating that the brining process removes the aerobes, yeasts, and molds but stimulates growth of LAB in cabbages (10). Kim et al. (9) also reported that counts of bacteria, molds, and yeasts decreased by 45%, 58%, and 40%, respectively, by the process of salting and washing, showing that fermentation is mainly carried out by cabbage LAB after the brining process. Other microorganisms of ingredients other than the cabbages may also be involved in the fermentation, but LAB from the brined cabbage seems to be the main microorganism (12). For the proper fermentation of kimchi, it is important to keep anaerobic conditions correct to minimize the growth of aerobic microorganisms and stimulate the growth of LAB during the fermentation. The Korean traditional earthenware crocks (Fig. 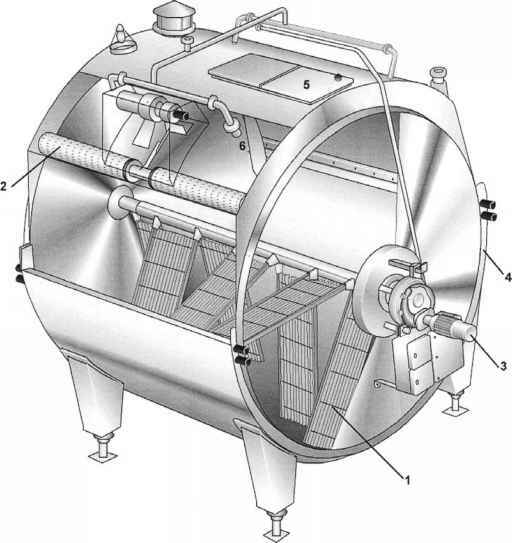 2) are excellent fermentation vessels that provide facultative anaerobic conditions during fermentation. 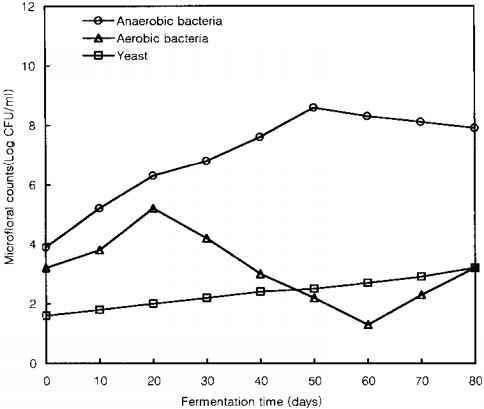 Figure 3 shows typical microbial changes in kimchi during the fermentation at 2 to 7° C. The number of anaerobic bacteria, usually LABs, increases, whereas aerobes, such as Achro-mobacter, Flavobacterium, and Pseudomonas species (16) usually decrease owing to the absence of air and salt content and acid formed during fermentation. Although the level of yeast is low, film-forming yeast increases in the later fermentation stages. The yeasts isolated from the kimchi were Saccharomyces, Tolulopsis, Debaryomyces, Pichia, Rhodotorula, Endomycopsis, Kluyveromyces, Cryptococcus, Trichospora, and others (17). Kimchi fermentation is initiated by Leu. mesenteroides (Leuconostoc sp. ), a hetero-fermentative LAB and a facultative anaerobe; it produces lactic acid, acetic acid, CO2, and ethanol as major end products. As the pH drops to 4.6 to 4.9 because of organic acid accumulation, Leu. mesenteroides is relatively inhibited. As shown in Fig. 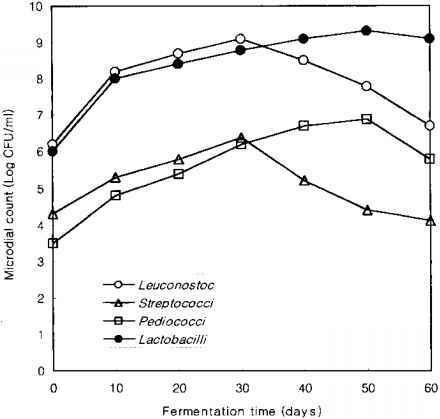 4, Streptococcus (St. faecalis) behaves similarly as Leuconostoc sp., but in lower numbers. The fermentation continues with more acid-tolerant LAB species such as Pediococcus cerevisiae, Lactobacillus brevis, Lac. fermentum, and Lac. plantarum (18). However, there is overlapping growth of the species. Also, the growth of each species depends on its initial numbers in the cabbage and other ingredients, the concentration of salt and sugar, the absence of oxygen, and the fermentation temperature, as already mentioned. Lac. plantarum is present in the greatest numbers following the initial fermentation and produces the maximum acidity at the later stages, especially at higher temperatures. Lac. plantarum is believed to be the main acidifying or deteriorating microorganism in kimchi fermentation (19). The presence of yeast in the later stage of kimchi fermentation can produce various tissue-softening enzymes, including polygalacturonase, which destroy pectic substances and other tissue structures of cabbages and radishes that will downgrade the kimchi quality. Softening of baechu's texture is a problem due to excessive acidification of kimchi during the overripening stage of the fermentation and preservation processes (20). Table 4 shows the frequency of gram-positive bacteria, mainly LAB isolated from kimchi fermentation at 5, 15, and 25°C, while Leu. mesenteroides and Leu. paramesenter-oides dominate (65.2%) at the low temperature of 5°C. However, the level was 13.5% at 25. The Lactobacillus species, mainly Lac. plantarum, produce lactic acid (homofermentative LAB) and dominates (59.7%) at high the temperature of 25 °C, dropping to 28% at 5°C (21). The levels of Streptococcus and Pediococcus species were lower than those of Leu-conostoc and Lactobacillus species and were found to decrease considerably at lower temperatures. This suggests that a fermentation temperature of 5jC creates better conditions for producing more flavorful kimchi and extends the preservation period, mainly owing to the growth of Leuconostoc. The kimchi fermentation process undergoes several distinct phases based on the changes in pH and acidity, CO2 levels, and sugar content, all of which are temperature dependent. The first stage has a rapid decrease of pH and an increase of acidity and CO2 levels. These changes are accompanied by a decrease of reducing sugars after the initial lag phase. The next stage shows a gradual drop in pH, a further increase in acidity and CO2 levels, and a rapid disappearance of reducing sugars. The final stage of fermentation proceeds with no or only slight changes in pH, acidity, CO2, and reducing sugars (3). The pH and acidity of optimally fermented kimchi are 4.2 to 4.5 and 0.4 to 0.8% as lactic acid, respectively. By monitoring various fermentation temperatures, Shin et al. (22) studied the chemical changes, LAB, and yeast counts in kimchi prepared by a large-scale commercial manufacturer. The optimum pH of kimchi, around 4.2, was reached within 2 days at 25°C, 3 days at 15°C, and 23 days at 5°C. As shown in Fig. 5, the pH significantly decreased to 3.6 and stayed the same at 25°C. However, at 25°C, the pH decreased slowly to 4.1 and stayed at the same pH at 5jC. The acidity levels were opposite to the levels of pH at the different temperatures. The acidity increased up to 0.9% at 25°C after 8 days, but increased to 0.5% after 44 days, maintaining almost the same level for 80 days at 5°C. Thus a low temperature of 5°C fermentation produces the best flavor, microorganism status, and preservation conditions. Discover How To Surprise Family and Friends With Homemade Bread? Is Your Bread Coming Out Doughy Or Crumbly? Well, you don't have to be frustrated anymore by baking bread that doesnt rise all of the way or just doesn't have that special taste. Which of the following species would be found during kimchi fermentation? How to isolate bacteria from kimchi? What bacteria is found during kimchi fermentation? Which of the following species would be found during kimchee fermentation? What types of organisms are present at the end of the kimchi fermentation? What types of organism are present at the and of kimchee? What types of colonies are found the the end of kimchi fermentation? Is kimchi bacterial or yeast fermentation?